This article is 1906 days old. 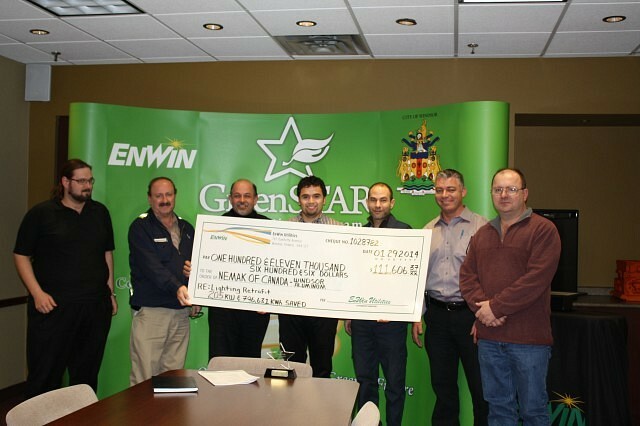 Nemak of Canada was presented with the GreenSTAR award by Enwin Utilities on Wednesday. They also received an incentive cheque for $111,606.37 for plant lighting improvements under the Ontario Power Authority’s ERII conservation program. The company earned the GreenSTAR Award after completing plant renovations to their dust collectors, lighting systems, re-insulation of an electric furnace, replacement of their sand lift system and installation of occupancy sensors in half of the washrooms on site. The GreenSTAR Award of Excellence is awarded by ENWIN to Windsor companies that demonstrate a commitment to the environment, achieve significant improvements related to energy and resource conservation efforts and go above and beyond to make conservation a key part of their business plan.